In India, thousands of patients die every year awaiting an organ transplant. Others turn to organ traffickers to buy organs from the poor who have been tricked into “donating their organs”. These illegal donations are done in terrible hospitals, with bad hygiene and unsanitary conditions leading to poor outcomes for both donors and recipients. MOHAN USA seeks to change this. 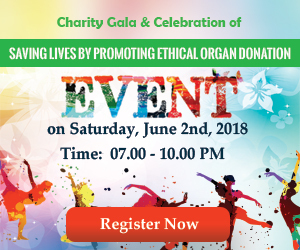 We aim to support and promote ethical organ donation in India that will not only give the thousands of patients a second chance at life, but also curb the illegal trafficking in organs. We believe that no one should die awaiting an organ, or have to buy one, or be reduced to poverty in their effort to survive the curse of terminal organ failure. Please join us in this effort by celebrating the launch of MOHAN USA. In return you will get to save many lives… you will get to be a hero. Where: Mirage Banquet Hall – 1655-150 Oak Tree Road, Edison, NJ 08820, United States.